Our “Brute Neighbors” caught on camera! Welcome TerraCorps Member, Marta LeFevre-Levy! 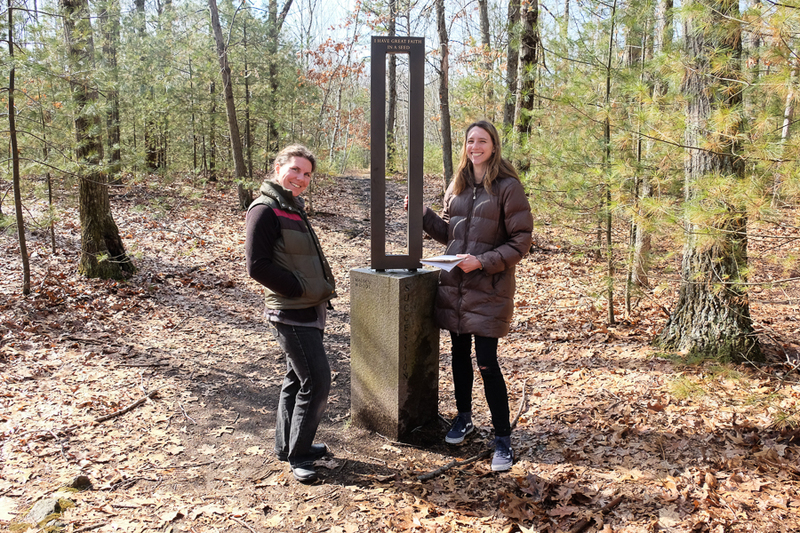 Despite the prognostication of the groundhog for 6 more weeks of winter, spring is just around the corner with a full schedule of programs and events at the Walden Woods Project. The coming months are a busy time for our organization as we prepare to reopen our organic farm, host a full complement of visiting school groups, finalize our professional development seminar for teachers, and announce the winners of this year’s Live Deliberately Essay Contest. In addition, we are actively pursuing several opportunities to protect key parcels of land in Thoreau’s Walden Woods, thereby adding to the acreage we currently steward. We manage nearly 170 protected acres on 14 sites within Walden Woods. We work to ensure that this national treasure remains a model of preservation and conservation to inspire an international ethic of environmental stewardship for generations to come. We will have an update on our conservation initiatives in our next newsletter. This year, we celebrate the 20th anniversary of the Walden Woods Project’s Thoreau Institute – our library and research facility located on our campus in Lincoln, just a short walk from Walden Pond. If you have not visited recently, we hope you will come by to view the exhibits in the reading room or use the collections. Hours of operation are Monday through Friday, 10-4. The library has limited staff. Therefore, we encourage you to call ahead at (781) 259-4730 or e-mail our curator at Jeff.Cramer@walden.org. Your friendship and support are deeply appreciated and are critical to furthering our mission. We hope you will consider making a contribution to help us protect more land in Walden Woods and expand our educational initiatives. The Guide to Walden Pond: An Exploration of the History, Nature, Landscape, and Literature of One of America’s Most Iconic Places is the first published guidebook to Henry David Thoreau’s most defining place, visited by half a million people each year. Many more know it as the fountainhead of America’s environmental consciousness. In the guide, Thoreau devotee Robert M. Thorson takes us on an amble around the pond’s shoreline, pausing to explore people, events, and the natural world in fifteen special places. With quotations from Thoreau’s Walden throughout, the place of his book merges with the book of his place. Dr. Robert M. Thorson is a Professor of Geology at the University of Connecticut and is the author of several books on Thoreau and his landscape. This event is FREE and open to the public. Doors will open at 7 PM for a wine and cheese reception with the author, sponsored by The Cheese Shop of Concord. The talk will begin promptly at 7:30 PM. There will be a book-signing by the author following the talk. To make reservations AND/OR to reserve a copy of the book ($16.99, paperback), please call 781-259-4707 or email your name, phone number, number of seats you’d like reserved and how you heard about the event to education@walden.org. Henry David Thoreau had a very modern way of looking at nature—something he called “a different intention of the eye”—that cleaved him through heart and marrow. Using examples from contemporary art, philosophy, and science, Andrew Menard explains Thoreau’s radical sensibility and suggests why it remains provocative today. Andrew Menard, an artist, writer, and critic, is the author of Learning from Thoreau, which will be released by the University of Georgia Press on May 1, 2018. To make reservations, please call 781-259-4707 or email your name, phone number, number of seats you’d like reserved and how you heard about the event to education@walden.org. Learning from Thoreau will be available for sale at the event ($26.95), with a book-signing by the author after the talk. The Thoreau bust sculpture we offered for sale last year is a huge success! 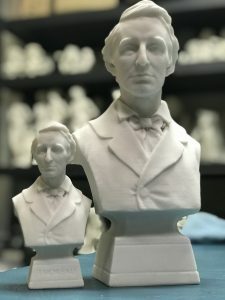 In addition to the 6” model, we are now offering a 12” version of Walton Ricketson’s 1898 original sculpture of Thoreau. These hand-crafted replicas are designed and made in the USA using a high-grade proprietary bonded marble. While they can weather any season, these beautiful artworks are best displayed indoors where they can inspire Thoreauvians – on desks, shelves, libraries, classrooms, or even a 10 x 15 house. Available for quick shipping from the Walden Woods Project. Please allow 4-6 weeks for delivery, direct from the distributor. Last fall, we wrapped up our tenth season at The Farm at Walden Woods. 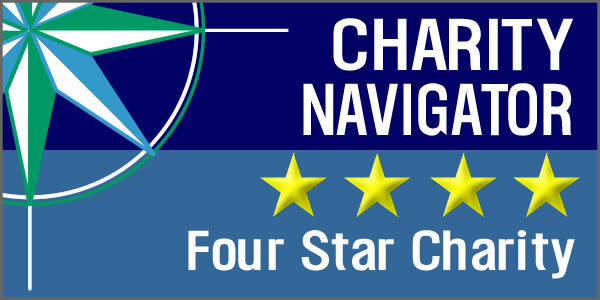 We are grateful for our loyal customers and we saw a large increase in our customer base. For those of you who visited us for the first time-we hope to see you again when the farm stand opens in a few months! In 2017, for the first time we sold our our own organic blueberries and strawberries. We spent several summers prepping our strawberry fields and tending to our blueberry bushes with the hope of yielding a strong enough crop for sale. We look forward to stronger yields this year. We also experimented with solarization, the process of covering a growing area with solar plastic for the entirety of the growing season. The heat and moisture beneath the plastic encourage the germination of weed seeds, however the extreme heat quickly kills off the seedlings, effectively destroying the weed potential in that growing area. We look forward to uncovering the area this year to see if the solarization process was successful. While we enjoyed the mild weather last summer, we experienced a few weather events that left their mark on the farm. The most impactful was a micro burst of wind that blew down all of our ornamental corn. Unfortunately, very little of the corn survived and our fall backdrop was not as striking as in years past. Last season, we continued to supply local restaurants with farm fresh produce. We have worked closely with Chef Charlie Foster at Woods Hill Table and Chef Guilherme at Papa Razzi who identified specific items they required for their menu. It is exciting to see our vegetables incorporated into their stunning dishes. This year Woods Hill Table owner Kristin Canty and Chef Charlie Foster will be opening Adelita, a new organic Mexican restaurant in West Concord, MA. We are delighted to add Adelita to the restaurants that will use The Farm at Walden Woods produce. Summer is around the corner! The farm stand will be open in June through the end of October-look for the “Open” flag! It is often debated whether Thoreau would have embraced many of the new-fangled tools and gadgets of the modern age, if he lived today. Would Henry have been seen around the coffee shops of Concord, consuming newspapers on a tablet? What would he have thought of weather apps? One thing we should all be able to agree on is that he’d be enamored of wildlife cameras. When he finally broke down and purchased a telescope, his world opened in new ways, and he had the opportunity to closely observe nature from afar. Wildlife, or “trail” cameras take that advantage a step further, and allow us to observe wildlife without being anywhere near it, which lets us see them behaving in their most natural ways. Over the past decade or so, remote-triggered “game” cameras have become increasingly available. They were developed primarily for use in hunting, but as their quality has increased and prices dropped, they have become a widely-used tool among ecologists looking to detect wildlife species that are secretive, active only at night, or otherwise difficult to observe. Over the past couple of years, the Walden Woods Project has deployed an array of wildlife cameras around our properties in Walden Woods. We want to learn what wildlife species benefit from our conservation efforts, and we also use them to evaluate the effectiveness of our land management in terms of recreational use of our properties. While we haven’t detected any wildlife species that were unexpected or surprising, we have been seeing a steady stream of a variety of species at most of our properties around Walden Woods. 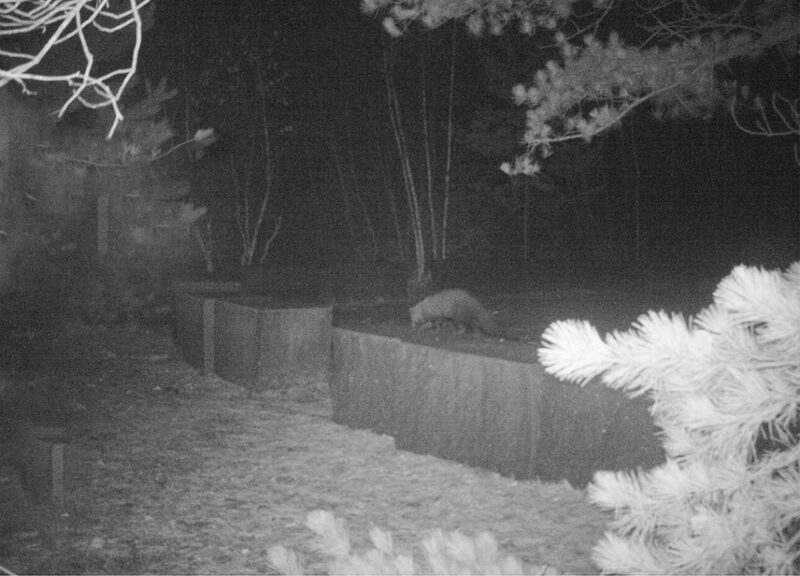 Deer, raccoon, coyote, and fisher are among the large animals that we regularly encounter on our properties. We anticipate capturing an image of a moose or bear, as these species are becoming more and more common around eastern Massachusetts, and will keep our cameras trained on attractive wildlife habitats around Walden to see who swings by. Connect with us on Facebook and Instagram for sightings! An inquisitive white-tail deer takes a close look and we get a close-up! 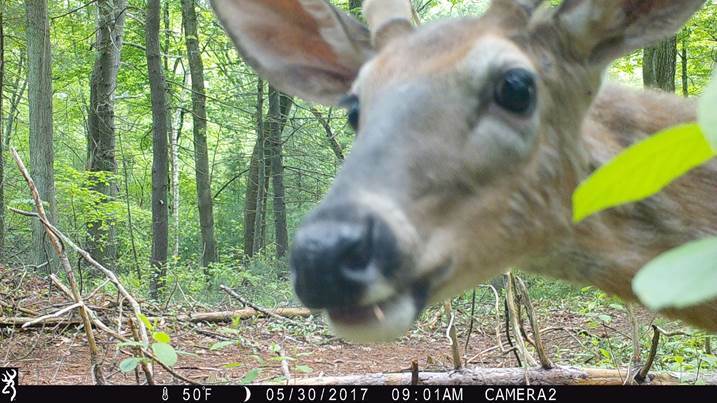 Deer are common in eastern Massachusetts, and have been frequently captured on our cameras in Lincoln and Concord. 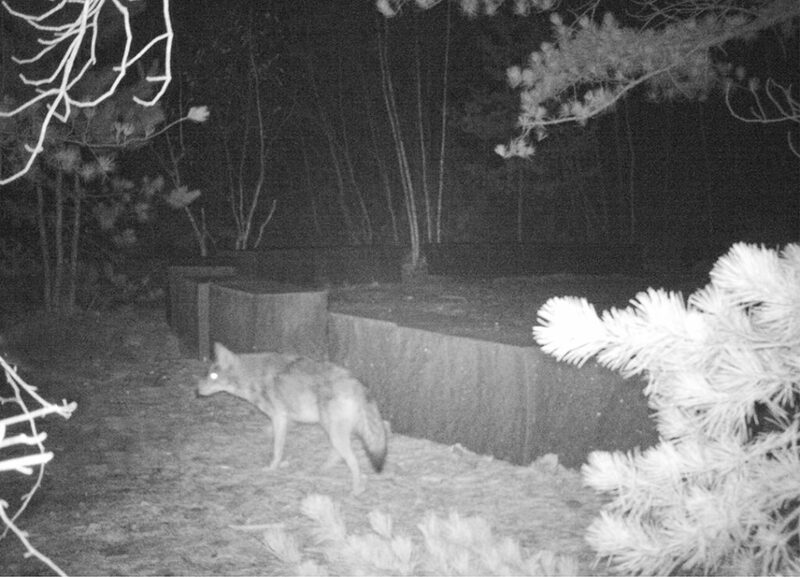 Eastern coyote have adapted well to humans and are increasingly common throughout Massachusetts. Fisher, also known as fisher-cats, are beautiful, large weasels that have made a significant comeback in the eastern US after being extirpated for over a hundred years. Fisher have a bad reputation among many, but generally do not deserve it. They are secretive and elusive. 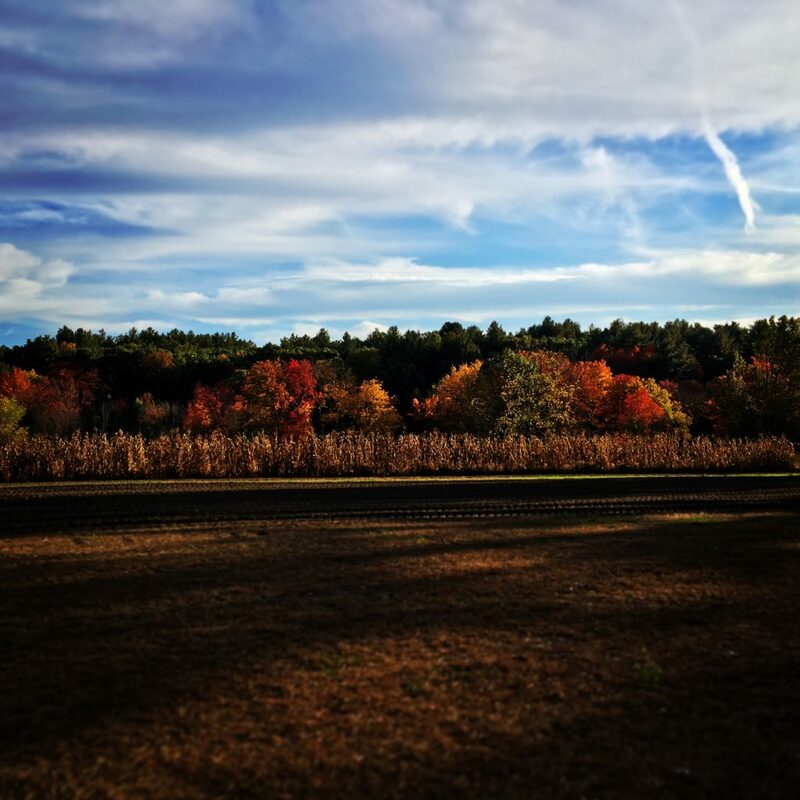 THE WALDEN WOODS PROJECT WELCOMES TERRACORPS MEMBER, MARTA LEFEVRE-LEVY! The Walden Woods Project is delighted to have been selected as a host site for a 2018 half-term TerraCorps (a program of AmeriCorps) service member! On February 13, Marta LeFevre-Levy began her work with us as Youth Education Coordinator. The overarching goal of the TerraCorps Youth Education Coordinator position is to “build long-term capacity of host sites by engaging youth in service-learning, experiential education, and inquiry-based science and nature learning projects.” To that end, Marta will help us develop curricula and engage with new audiences through group visits and programs. Marta is excited to work with the Walden Woods Project for the next five and a half months. She is looking forward to the opportunity to learn more about curriculum writing, outreach, how non-profits run, and, of course, everything Thoreau. She received her B.A. in Biology in 2014 from Macalester College and has worked in conservation positions around the country, including with the US Forest Service and the Bureau of Land Management. Her background is in plant ecology and rare plant conservation. She loves working with youth in the outdoors, having previously worked as an education intern with the New York Department of Environmental Conservation and as a National Crew Leader with the Student Conservation Association. Her interests include local and medicinal botany, yoga and meditation, walking in nature, and backcountry exploration. We are so happy to have Marta joining our team, with her impressive experience and thoughtful approach to environmental education. She has already jumped right in and is planning a milkweed planting project at Bear Garden Hill, as well as brainstorming lesson plans connected with that site. We look forward to sharing Marta’s progress on those and other initiatives with the community! Like the old “who’s buried in Grant’s tomb” question, every so often the “who’s buried in Thoreau’s grave” question comes back to haunt us. Most recently it was brought to our attention by Walden Woods Project friend and supporter, Dr. Ira Skolnik, who saw a photograph of the Thoreau family plot which looked different from what he remembered seeing at Sleepy Hollow Cemetery. 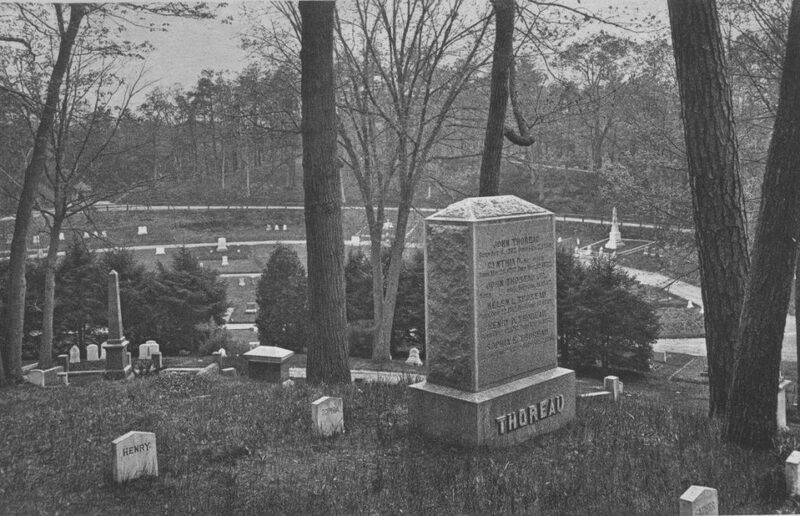 When Thoreau’s remains were moved from the Dunbar plot in the New Burying Ground up to Author’s Ridge in Sleepy Hollow, the graves had red sandstone markers. These were replaced in 1890 with a large granite monument and, shortly thereafter, the smaller stones that are there still. At this time there was a mix-up in the placement of Henry and his sister, Sophia’s, stones. There exist two undoctored images from the 1890s (though undated further) by the local photographer, Alfred Hosmer, which show, in one, Sophia on Henry’s left, and in the other, Henry on Sophia’s left. Later images, such as the one below by Herbert Gleason, continue to show the Henry-on-the-left version. The most logical explanation is that when the stones were first placed and captured in an image by Hosmer, the stones had Sophia to her brother’s left, after which someone noticed the error and the stones were placed in what is the correct order, but there is no record that has yet been found offering any explanation or corroboration. As there was a brief period between the placing of the large granite monument and the smaller stones, following the order of the death dates to lay the stones and so placing Sophia’s stone the furthest left as the last interred would also make sense. Records of Sophia’s funeral do not shed any light on the mystery. As Thoreau said in his 1851 journal, “We are surrounded by a rich and fertile mystery.” We did what he suggested – “May we not probe it, pry into it, employ ourselves about it, a little?” Not every mystery has a solution, or perhaps, not every mystery has an answer when we first ask the question. It is why researchers and historians keep probing and prying. This is part of the excitement about research. The mystery, the conundrum, and the faith that sooner or later a letter, a photograph, a map will surface that will give us the answer. It is why the Walden Woods Project’s Thoreau Institute Library continues to collect and add to our collections, having grown from eight collections when we opened in 1998 to twenty now. Each new collection adds one more dimension to the whole. And who knows? The next letter added, the next manuscript, the next historic photograph, may answer the question: Who’s buried in Thoreau’s grave? During our research, we leaned that the fee for perpetual care of the Thoreau family plot was never remitted. The Walden Woods Project covered these costs in honor of Thoreau and his family. We invite you to contact us at (781) 259-4700 or send us an e-mail using our Contact form. Please consider supporting our mission. Thank you.